For other uses, see Leather jacket (disambiguation). A leather jacket is a type of clothing—a jacket-length coat—usually worn on top of other apparel, and made from the tanned hide of various animals. The leather material is typically dyed black, or various shades of brown, but a wide range of colors is possible. Leather jackets can be designed for many purposes, and specific styles have been associated with the subculture called greasers, biker, military aviators, police, and music subcultures (punks, goths, metalheads, rivetheads), who have worn the garment for protective or fashionable reasons, and occasionally to create a potentially intimidating appearance. Most modern leather jackets are produced in Italy, Pakistan, India, Canada, Mexico and the United States, using hides left over from the meat industry. Fabrics simulating leather such as polyurethane or PVC are used as alternatives to authentic animal hide leather depending on the needs of the wearer such as those pursuing vegan lifestyles or for economic reasons as synthetic fibers tend to be less costly than authentic leather. In the early 1900s, brown leather flight jackets were worn by aviators and members of the military. During the second world war, they became known as "bomber jackets" and were heavily insulated and prized for their warmth. The jacket was often part of an overall uniform ensemble meant to protect bomber pilots from exposure to the extreme climate conditions found at high altitude, and sometimes incorporated sheepskin, using the intact fleece on the inside for warmth. Leather jackets were also commonly worn by Russian Bolsheviks and were nearly a uniform for the Commissars during the Russian Civil War, and later for the members of the Cheka. This practice is said to have been initiated by Yakov Sverdlov. Antelope, buckskin, lambskin, sheepskin, and cowhide are the hides most commonly used to make leather jackets. As soon as the skin is removed from the animal at the meat processing plant, it is refrigerated, salted, or packed in barrels of brine. It is then sent to the tannery where the skins undergo a series of processes designed to preserve and soften the hides. Sewing materials such as thread, lining, seam tape, buttons, snaps, and zippers are generally bought from outside vendors and stored in the garment factory. In the later-half of the 20th century, the leather jacket—in many forms—achieved iconic status and general acceptance through an inextricable link to Hollywood. Such jackets were popularized by numerous stars in the 1940s and 1950s, including actor Jimmy Stewart (Night Passage, 1957), who had actually commanded a U.S. bomber squadron during World War II. The brown leather jacket has become a de rigueur part of wardrobe for the Hollywood adventurer, from Gary Cooper in For Whom the Bell Tolls to Harrison Ford in the Indiana Jones film series. A leather jacket could be used to shape a character, providing an important ingredient used to define the very essence of 'cool'. Prime examples include the Perfecto motorcycle jacket worn by Marlon Brando's Johnny Strabler in The Wild One (1953), Honor Blackman as Cathy Gale in The Avengers, and Michael Pare in Eddie and the Cruisers duo (1983 and 1989). As such, these all served to popularize leather jackets in American and British youth from the "greaser subculture" of the 1950s and early 1960s. Later depictions of this subculture are seen via The Fonz from the television series Happy Days, which was produced in the 1970s and 1980s, but shows life in the 1950s and 1960s (Fonzie's leather jacket is now housed in the Smithsonian Institution), and in the film duos Eddie and the Cruisers and Grease. Flight jackets, also (occasionally with fleece collars, as seen in the 1986 film, Top Gun), have remained fashionable for decades. There are many more examples of iconic leather jackets worn in popular culture, such as the one worn by the T-800 character of The Terminator films and the longer ¾ length trench coat style worn by action heroes such as Steven Seagal, and Keanu Reeves and Laurence Fishburne in The Matrix films, or by Richard Gibson as Herr Otto Flick in the Allo Allo TV Series. Another example is the leather jackets worn by Brad Pitt in Fight Club, where the antagonist Tyler Durden constantly appears with different variations of his 'red' leather jacket. Other famous leather jacket icons include those worn by members of the Black Panthers in the 1960s and 1970s, the Ramones which made it a trend in the punk subculture, members of heavy metal subcultures, etc. In most pop culture examples, the jackets are worn by people cultivating an intimidating and potentially violent or rebellious image. The tan leather jacket in particular has become very popular with the Brit Pop and Indie music image and culture and is famously worn by people such as Kelly Jones of the Stereophonics. The Punk culture also "rocks" the leather jacket with accessories such as chains, studs, cuts, ands sketch designs. Many "Metal Heads" go with the Judas Priest look (black leather jacket, black leather pants, chains, and lots of metal studs). Leather jackets form a key part of Gwen Cooper's (Eve Myles) characterisation and developing character identity in the British science fiction show Torchwood. There is a substantial difference between leather jackets made for fashionable purposes and those worn for protection, such as motorcycle personal protective equipment. Leather jackets designed for protective use are safety equipment and are heavier, thicker, and often equipped with armor, thus becoming a practical item of clothing regardless of the symbolism invested in them by popular culture. 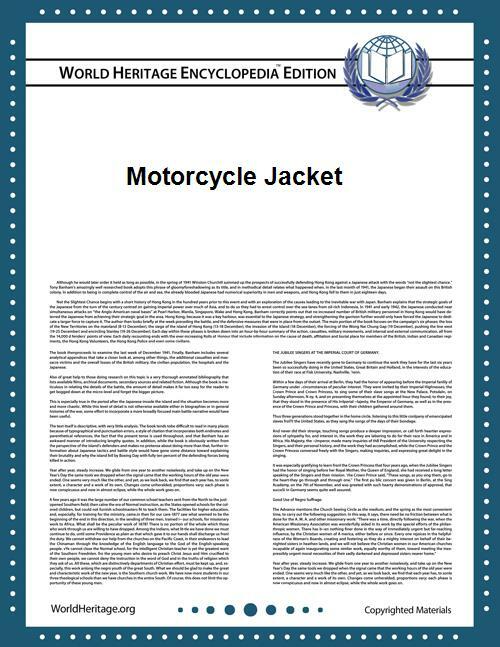 A leather jacket primarily designed for fashion purposes is not likely to be of much use in a motorcycle accident due to their light construction. Motorcycle jackets often have more substantial zips, weatherproof pockets and closures, higher collars, and are styled to be longer at the back than the front to protect the kidneys of the riders from the cold while they are bent forward over their motorcycle. Commons has media related to Leather jackets.